This page contains animations of numerical solutions to Maxwell's equations in a 2D domain (using the Finite-Difference Time-Domain method, FDTD). 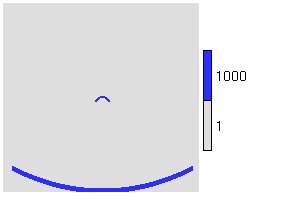 A wave is generally excited at the bottom of the domain and propagates upwards. The interaction with the various distributions of complex dielectric constant (the square of the refractive index) demonstrates many phenomena that occur both in nature and in scientific instruments. 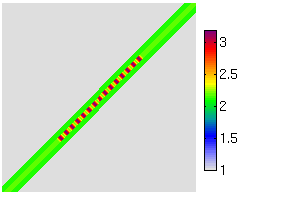 The plots below show the field of dielectric constant - click on them to see the animation of the component of electric field perpendicular to the plane of the domain. This package provides the code for programs that read a simple ASCII configuration file that describes a distribution of dielectric constant, and then runs the simulation. 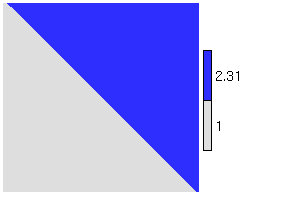 The output is either in the form of an animated gif or a NetCDF data file. The code was written by Robin Hogan, tested on Linux, and is in C. Please read the README first. Propagation of electromagnetic waves in a vacuum. 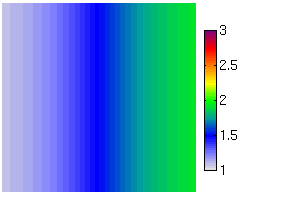 Propagation of electromagnetic waves in the presence of a gradient in refractive index. The bending of the wave is what happens in mirages, shimmering of the light over a hot surface and anomalous propagation of radar beams. 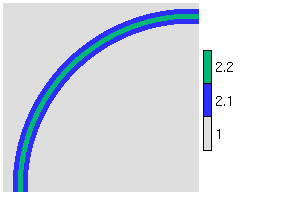 A sharp change in refractive index results in specular reflection from the surface and refraction into the medium according to Snell's law, with a reduction of the wave speed. 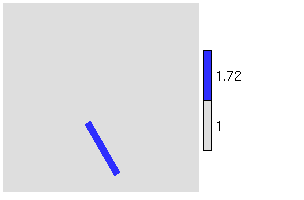 The animation shows two panels: the left shows the complete wave field, while the right shows just the component that is scattered (calculated simply by subtracting the equivalent field in a vacuum). The bending of the light explains why the bottom of a pool of water appears is nearer than it really is. This kind of reflection is occasionally seen by clear-air radars as Fresnel scattering from sharp horizontal gradients in atmospheric refractive index. Consider light propagating in a medium of higher refractive index incident upon an interface to a medium with lower refractive index. If the angle beween the direction of propagation and the normal to the interface is greater than the critical angle then total internal reflection will occur. This property is used in the prisms of bicycle reflectors and is easy to observe when looking through water into air. Consider the same set-up as with total internal reflection, but introducing a new medium a distance of order a wavelength away from the original interface. In this case, there is still some propagation across the gap, a phenomenon known as frustrated total internal reflection. A small point with a different refractive index to its surroundings oscillates as a dipole under the influence of the incident electric field, and reradiates energy in all directions. In 3D this is known as Rayleigh scattering and atmospheric examples are scattering of sunlight by molecules and scattering of weather radar beams by cloud and rain droplets. As the previous example, but this time the point is illuminated with two frequencies simultaneously. It is found that the higher frequency is scattered much more effectively than the lower frequency, explaining why the sky is blue. When the particle size approaches the wavelength of the radiation then the front and back of the particle do not experience the same incident electric field and so there is interference of the scattered wave from the different parts of the particle. The result is that forward scattered waves constructively interfere and backscattered waves destructively interfere, i.e. there is a preference for forward scattering. 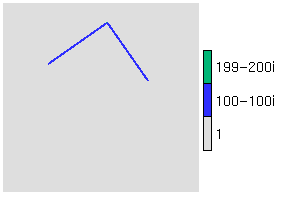 The scattered amplitude in the animation is shown at twice its true amplitude. Atmospheric examples are a reduced backscatter for high-frequency cloud radars when looking at larger particles such as raindrops and large snowflakes and the corona around the sun when it passes through aerosol and haze particles. 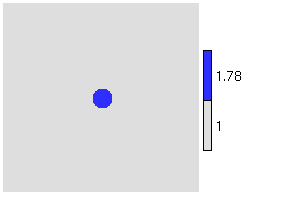 As the particles become larger the width of the forward scattered lobe becomes narrower. The degree to which this occurs is important for interpretting multiply-scattered lidar signals as the forward-scattered radiation stays within the field-of-view of the receiver. 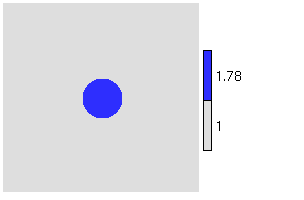 Even larger particles exhibit more complex scattering patterns; scattering by large spheres of constant refractive index can be calculated exactly using Mie theory. The preferential scattering in particular directions leads to rainbows. Internal reflections and refraction on the flat surfaces of ice crystals leads to scattering in particular directions and explains various optical phenomena in ice clouds. Bragg scattering is used to probe the structure of crystaline solids with X-rays. Each atom in a lattice behaves similarly to a Rayleigh scatterer under the influence of the incident wave, and certain wavelengths result in constructive interference in particular directions. 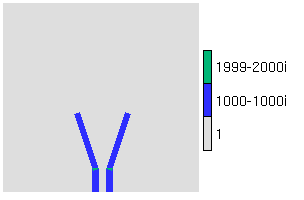 This enables the structure of the material to be inferred. A further example of Bragg scattering using the same configuration of atoms as before, but with a higher frequency resulting in a different scattering pattern. 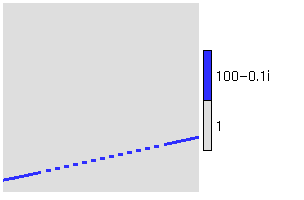 When there are fluctuations in refractive index on the scale of half the wavelength of the radiation, then the scattered waves constructively interfere in the backward direction (note that the apparent scattered wave travelling in the forward direction in this example is simply the energy extracted from the incident wave. This is how clear-air radars work, for which it is often referred to misleadingly as Bragg scattering. 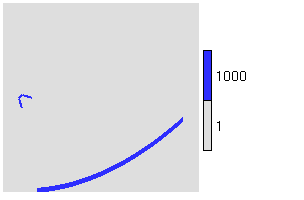 When the fluctuations in refractive index are not on the scale of half the wavelength (such as the example here where they are on the scale of the wavelength itself) then destructive interference means that no significant backscatter is detected. A horn antenna is commonly used as the feed for a dish antenna, and simply consists of a flaring at the end of a waveguide that results in a reasonably confined beam. This animation illustrates a parabolic dish antenna, which converts the spherical wave from a simple horn antenna (the "feed horn") into a plane wave. The very high refractive index of the curved metal surface acts as a near-perfect reflector. Weather radars use this kind of antenna. 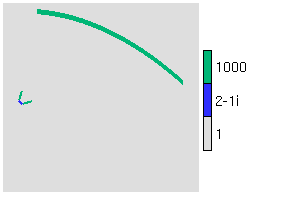 An Offset dish antenna is also parabolic, but the feed horn is offset and only one half of the parabola is illuminated. This prevents the feed from obstructing the outgoing plane wave. The CloudSat spaceborne cloud radar uses this kind of antenna for both transmition and reception (shown by the next example). The same offset dish antenna as in the previous example can also be used for receiving. Domestic satellite receivers tend to use this kind of antenna. 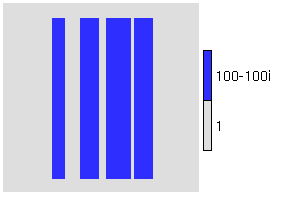 A phased array antenna utilizes a number (in this case five) of dipole antennas that oscillate in phase. The constructive/destructive interference pattern results in a main lobe of energy in the direction of interest and a number of weaker side lobes. Clear-air radars tend to use this kind of antenna. The configuration is as in the previous example, except that the dipole antennas now oscillate out of phase. The result is that the beam can be scanned electronically. This is the way that a wind profiling radar works. A microwave waveguide is normally a hollow metallic conductor, and must be more than half a wavelength in diameter to support electromagnetic waves without strong losses. 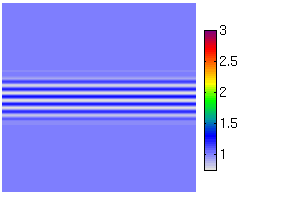 In this animation the same frequency wave is passed along waveguides with different diameters. 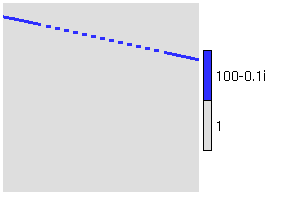 An optic fibre has a core with a slightly higher refractive index than the cladding layer surrounding it, and can act as a waveguide for light. 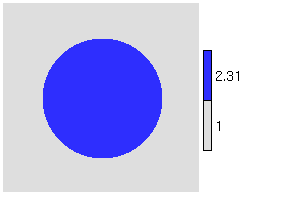 This animation shows a single-mode optic fibre, in which the diameter of the core is of the same order as the wavelength of the light, such that only one mode of wave can be supported. A fibre Bragg grating is an optic fibre with fluctuations of refractive index in the core. This leads to full transmission of all wavelengths except those close to the Bragg wavelength. 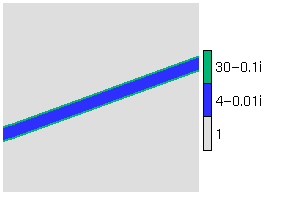 In this example a wave with this wavelength is propagated along such a fibre. The fibre is as in the previous example, but this time the wave has a slightly shorter wavelength than the Bragg wavelength leading to complete transmission. A diffraction grating diffracts light by an angle that depends on its wavelength. It consists of a series of equally spaced groves of a similar spacing as the wavelength of the radiation. 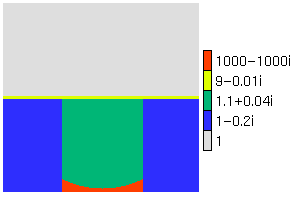 The simplest way to understand how it works is using Huygens' Principle; each grove acts like a separate source of electromagnetic waves, but the phase of each is offset from that of its neighbours to a degree that depends on the angle of the grating with respect to the incident ratiation. The diffraction angle is that which results in a constructive interference between all the different sources. The sources also combine constructively in the direction of the incident radiation. 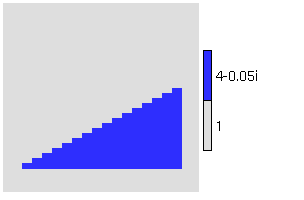 This example uses exactly the same grating as above, but the frequency has been increased by 50%. 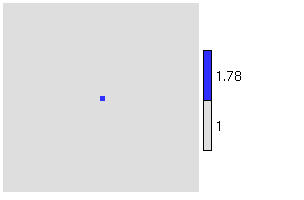 It can be seen that the diffraction angle is smaller, and there is a weaker second-order diffraction towards the right. This example again uses the same grating as above, but two frequencies are incident on it simultaneously. This demonstrates the ability of the grating to separate the different frequencies by different angles. A reflection grating is a type of diffraction grating that exploits the frequency dependence of the angle of reflection from a device with groves that have a spacing of the same order as the wavelength of the light. In this case two frequencies are incident on a reflection grating. Both are reflected significantly in the direction one would expect if the grating were a mirror, but the light is also diffracted into beams at an angle that is frequency dependent. A grism is a prism on which has been etched the grooves of a diffraction grating. It is used in astronomical instruments to filter light into different frequencies. 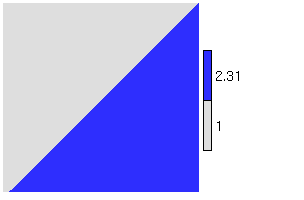 In this example, two frequencies enter the prism from the base, and on leaving the other side, a significant fraction of the radiation is refracted in the direction that would be expected for a usual prism. However, there is an additional diffracted component, the angle of which is frequency dependent. A Michelson interferometer was used in the famous Michelson-Morley experiment to demonstrate the non-existence of the luminiferous aether, a hypothetical medium in which light was believed to travel. 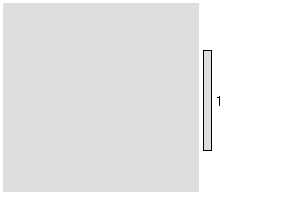 In the configuration to the left, coherent light is incident on a 45° half-silvered mirror (in this case simply a thin bar with a refractive index chosen such that half the light is transmitted and half is reflected). The transmitted and reflected beams travel equal paths to ordinary mirrors (in this case simply bars with a very high refractive index), and are reflected back and recombine at the 45° mirror. This results in constructive interference for the outgoing beam to the right. If the luminiferous aether existed and the earth was moving with respect to it, then light would be expected to travel at different speeds along the two orthogonal paths, resulting in a change in the interference behaviour depending on the orientation of the instrument and the time of year. The fact that this behaviour was not observed demonstrated that this aether did not exist. A Fourier transform spectrometer consists simply of a Michelson interferometer but with with one of the two mirrors movable. 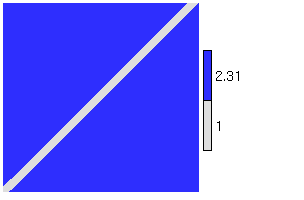 When one of the path lengths is changed by a quarter of a wavelength (as in this example), the radiation from the two paths destructively interferes in the rightward direction. Instead, the light constructively interferes in the downward direction (unlike in the previous case). The frequency spectrum of incoming light may be obtained by measuring the intensity of the outgoing radiation to the right as a function of the path length, then performing a Fourier Transform on it. This principle is used by a number of meteorological satellites instruments, such as AIRS and IASI. The same mirror configuration as in the previous example, but now two frequencies are used simultaneously. It can be seen that only one of the two frequencies emerges to the right. Again, the frequency dependence of the transmission is key to the workings of a Fourier Transform spectrometer. 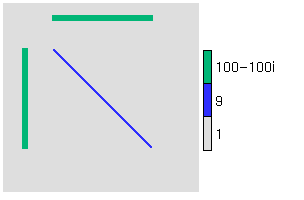 This animation illustrates Young's double-slit experiment demonstrating the wave nature of light. 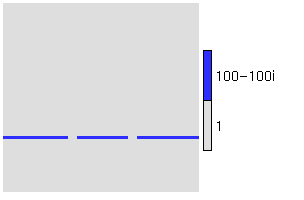 An oscillating dipole illuminates two slits in a metal barrier, which themselves act as coherent oscillators that produce an interference pattern at the top of the domain. The focussing effect of a convex lens. A corner reflector reflects radiation back in the direction from which it came over a wide range of acceptance angles. They can be used to calibrate meteorological radars. Campbell-Stokes sunshine recorders are widely used to record the duration of bright sunshine during the day. A glass globe focusses the light on to a card and as the sun moves across the sky, a scorch mark is left on the card, the total length of which is proportional to the number of hours of bright sunshine. Microwave ovens utilize microwave radiation with a wavelength of around 12 cm (2.45 GHz). The holes in the window are much smaller than the wavelength and hence virtually no radiation can escape. At this frequency, the water in food absorbes microwave radiation via the imaginary part of the refractive index. A Fabry-Perot etalon consists of a dielectric material between two reflective surfaces, and only permits light to pass through it if the wavelength is such that there is constructive interference of the internal reflections. A laser consists of a gain medium in which light is amplified: this may be represented by a dielectric constant with a positive imaginary part. The medium lies in a resonant cavity, consisting of two mirrors allowing light to reflect back and forth. 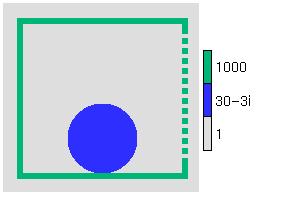 One of the mirrors is half silvered, which is where the coherent laser beam is emitted. 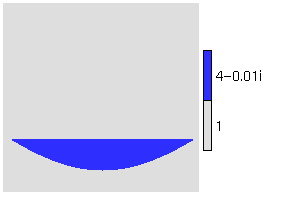 A sponge layer absorbs waves leaving the domain, but this is not perfect so there are sometimes odd effects at the edge of the domain. The simulations are two-dimensional, so effectively we have assumed the dielectric constant to be constant in the third dimension. This means that in the "Particle scattering" section we are not strictly simulating Rayleigh and Mie scattering, but actually the scattering for wires of different diameters. Nonetheless, most of the same phenomena are observed.